RRMM Architects is one of the 2018 recipients of the Governor’s Volunteerism and Community Service Awards. These awards recognize the significant contributions of Virginia citizens to the life and welfare of the Commonwealth and its people. Awards are presented in nine categories; RRMM won the award for the “Outstanding Corporation” category. 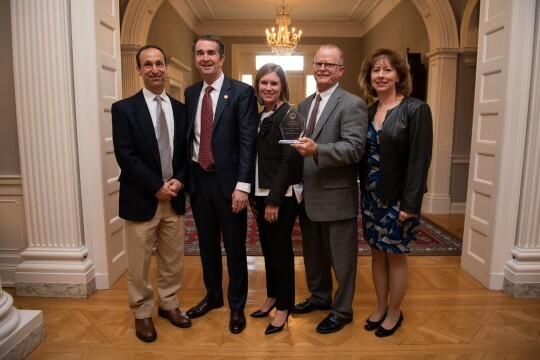 Winners of the 2018 Governor’s Volunteerism Awards were honored at a special ceremony last Tuesday evening at the Governor’s Mansion. RRMM Architects was nominated for the award by the Virginia Beach Education Foundation. RRMM has a strong history with Virginia Beach City Public Schools, recently completing Old Donation School and currently working on the design for the new Princess Anne Middle School replacement. RRMM has had the opportunity to include students in the planning and design of major projects. For Old Donation School, students and designers collaborated on sustainable building practices and STEM connections. Students’ visions played a large role in the project, from choosing details such as window colors, to determining larger features like the image of the Chesapeake Bay watershed embedded in the floor of the main atrium. Not only is RRMM dedicated to the students and staff at the heart of the buildings they design, the firm is involved with a variety of other causes. Throughout the year, employees can opt in and donate portions of their paychecks to United Way. During October’s Breast Cancer Awareness Month, employees donate to the American Cancer Society and wear pink in support of the cause. This past year alone, employees have stuffed Salvation Army Christmas stockings and donated toys to Henrico Christmas Mother, collected canned goods for the Thanksgiving food bank drive, and sent clothes, personal care items and school supplies to those affected by Hurricane Harvey.